Again? Didn't they try this a few years back? That one didn't last as long as the 80s version did. I will be very surprised if it is successful, because it doesn't have the one thing it needs...Rod Serling. It won't have his voice. It won't have his image. It won't have his guidance. And most important of all, it won't have his writing. Rod Serling WAS AND IS the Twilight Zone. Along with Serlings writing the original series was blessed with writers like Bradbury, Matheson and Beaumont. Todays writers just don't have the same grasp on fantasy as those. Looks like this new CBS All Access version will have plenty of nods to the original — with an incredible cast to match. After that hair-raising Us trailer, it’s almost an expectation now that a Jordan Peele project is going to have a great trailer. The upcoming reboot of The Twilight Zone, for which Peele serves as both host and executive producer, seems to be no exception. Anyone looking for clues at how this new version will veer away from — or pepper in nods to — its predecessor will have plenty to unpack here. Adam Scott’s episode, titled Nightmare at 30,000 Feet, already had plenty of potential to follow in the footsteps of installments led by William Shatner and John Lithgow. Judging by the way that toy washing up on the shore looks an awful lot like the monster Shatner’s character saw on the wing of his plane, this series seems to be following in a pretty solid lineage. Above all, the trailer is a gold mine for the horror staple of innocent-seeming lines feeling awfully threatening in this context: “We don’t have a dog,” “What are the odds of that?” and “Are you happy with your life?” are all enough to get someone’s skin crawling, even before the staccato riff on the iconic theme music. People walking backwards certainly does the trick, too. Aside from the previously announced cast that includes the likes of John Cho and Sanaa Lathan, this first look also sprinkles in some new unexpected faces. In addition to a first look at Tracy Morgan, the new trailer hints at appearances from Chris Diamantopoulos and Glenn Fleshler, too. And let’s all take a second to marvel at Steven Yeun’s very good hat. So many questions are still left: What happened to make Kumail Nanjiani say, “What did you do to me?” Why does that jukebox feel so dangerous? Is Jacob Tremblay’s character … mrunning for office? This is a wonderful post, Eadie. You did a masterful job (again) of pasting an article for use to enjoy and making it easy for us to go to the source! For the record, the enthusiasm I had for The Twilight Zone I had in my youth has dwindled over the years, mostly because I realized, after purchasing the box set, that very few of the episodes were truly science fiction. The vast majority of the episodes are only marginally sci-fi or not even remotely related to that genre. For that reason, I recently gave my box set to my daughter, All Sci-Fi member Ticket2theMoon, so she could enjoy it with my two grand children (which includes another All Sci-Fi member, Tantus Starbucker. I only watched a few of the first reboot of the series, and I don't remember any of them being science fiction either. However, even though I've never been a fan of the original Outer Limits, I love the reboot of that series and I'll probably buy the box someday. It has 154 episodes, many of which I've seen and loved. The complete box set is $95.00, which works out to about 62¢ per episode! Good grief, my breakfast each morning at Phat Daddy's Cafe is only $4.80 (without the tip). That would buy me almost eight episodes! Hey, I remember seeing that one! 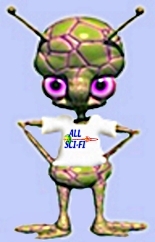 I wonder if the current popularity of science fiction might urge the producers to give the reboot a more sci-fi slant. I hope so. The signpost ahead reads The Twilight Zone, ushering viewers to a realm that at once feels familiar and yet is almost entirely new. Executive producers Jordan Peele and Simon Kinberg have reimagined Rod Serling’s classic horror/science-fiction/fantasy series from the ‘60s for a whole new generation. Kinberg also said that the vision Peele and CBS All Access had meshed with how to tell stories while pushing it to the limits. “We would do what Rod’s instinct and impulse was, which was to break barriers, to tell new kinds of stories, to create something that was so outrageous and noisy and dangerous that it wouldn’t fit into sort of the standard way of storytelling,” he said. Synopsis: Comedian Samir Wassan (Kumail Nanjiani) wants to be famous … but at what cost? Writer: Glen Morgan and Marco Ramirez; Story by Simon Kinberg, Jordan Peele, and Marco Ramirez. Based on the teleplay and short story Nightmare at 20,000 Feet written by Richard Matheson. Synopsis: Journalist Justin Sanderson (Adam Scott) finds the fate of Flight 1015 in his hands. Synopsis: Nina (Sanaa Lathan) has an old camcorder that can rewind time, but can it help her ensure the future of her college-bound son Dorian (Damson Idris)? Synopsis: On Christmas Eve in Iglaak, Alaska, a mysterious traveler (Steven Yeun) wishes to be pardoned by Captain Lane Pendleton (Greg Kinnear). In the video below and the extended trailer, Wise and her castmates can be seen in what appear to be spacesuits on some kind of ship. It was also announced that Seth Rogen would star in one of the episodes listed above, written by Alex Rubens. No other details were given at the time. The producers have also reiterated there will be plenty of references and homages to Serling’s classic series. If viewers want a starting point for those 156 episodes, both Peele and Kinberg have shared their five favorite episodes of the original series, which may yield some clues as to what to expect in the reboot. All episodes can be streamed on CBS All Access and Hulu, as well as select episodes on Netflix and Amazon Prime Video. To Serve Man (Season 3, Episode 24): The Kanamits, 9-foot-tall aliens, arrive on Earth with one lofty goal: to serve man. Mirror Image (Season 1, Episode 21): Millicent Barnes sees her double at a bus terminal. Peele also revealed that this episode inspired his story for Us. Living Doll (Season 5, Episode 6): Erich (Telly Savalas) is displeased when his wife buys an expensive doll for his step-daughter. He becomes even more displeased when the doll tells him it doesn’t like him. The Invaders (Season 2, Episode 15):A flying saucer lands in the attic of an isolated house inhabited by an impoverished woman (Agnes Moorehead) — who soon becomes panic-stricken as tiny spacemen begin to stalk her. The Monsters Are Due on Maple Street (Season 1, Episode 22): Paranoia strikes the residents of Maple Street when they believe human-looking aliens have invaded the neighborhood. Time Enough at Last (Season 1, Episode : A bookworm (Burgess Meredith) yearns for more time to read – then a nuclear holocaust leaves him alone in the world with lots of time, plenty to read and one ironic twist. It’s a Good Life (Season 3, Episode : Little Anthony Fremont controls an entire town with his ability to read minds and make people do as he wishes. Which is a real good thing. Nightmare at 20,000 Feet (Season 5, Episode 3): Mr. Wilson (William Shatner) believes he sees a gremlin on the wing of a commercial aircraft he is a passenger on. The Twilight Zone will premiere with two episodes on April 1, followed by a new episode every Thursday beginning April 11 on CBS All Access.